Did a website, friend, co-worker or colleague mention the book “The Mythical Man-Month”? Few books on software project management have been as influential as The Mythical Man-Month. The same thing happened to me and I wish this book had been available when I wanted the essential teachings of The Mythical Man-Month. So, I wrote it. This book is a helpful summary of “The Mythical Man-Month” by Frederick P. Brooks, Jr.
You can consume this guide in one sitting. This is the book I wanted. It is a summary of all the things you need to know in a compact, easy to read, low-risk format. 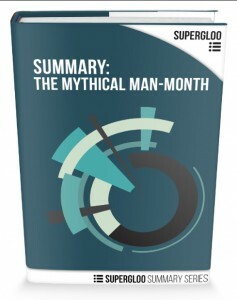 If you do not want to save your time and effort with this summary of The Mythical Man-Month, please buy or borrow or the original. It’s an excellent book. I encourage you to do so. This summary guide saves your time and effort. 1) Developers, engineers, and managers who need The Mythical Man-Month principles summarized. 2) Developers, engineers, and managers who need a refresher on the lessons from The Mythical Man-Month. A compact summary of the principles of The Mythical Man-Month in a fast, convenient format. Written by a developer and manager with 20 years of experience in software development who wants to help you. Saves your time. Everything has been organized for you.